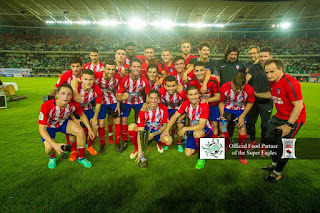 Nigeria’s former U17 World Cup winners Kelechi and Chidiebere Nwakali were quite the cynosure of eyes as the Super Eagles B squad narrowly lost 2-3 to newly-crowned Europa League champions Atletico Madrid in Uyo on Tuesday. 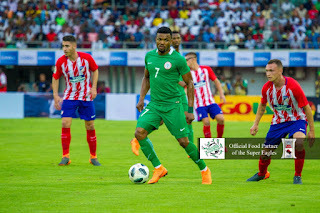 The younger Nwakali (Kelechi), who captained the Class of 2015 to Nigeria’s fifth cadet title in Chile, served as a big coefficient of elder brother Chidiebere (a member of the 2013 winning team) in the midfield, and alongside lanky orchestrator Alhassan Ibrahim, sent ample signals to the visitors early on that they would have their work cut out on the evening. Kadiri Samadi, Ibrahim and Emem Eduok had sight of goal at various times and Kevin Gameiro had side –netted in a flurry of exchanges in the opening half hour, before Kelechi brought the crowd onto their feet with a superb, angled shot from 22 yards that Goalkeeper Jan Oblak had no answer to. However, the Spaniards were level two minutes later, when Angel Correa equalized after Eduok lost the ball in midfield and Gonzalez Sergio pounced. 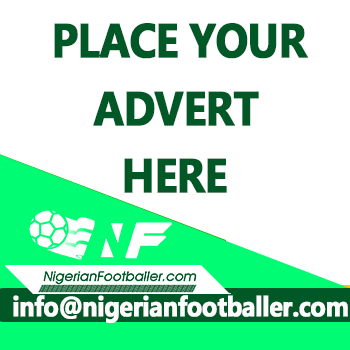 Goalkeeper Olufemi Thomas then did well to save off an advancing Gameiro, but the Eagles deserved to go into the break on top, only for substitute Destiny Ashadi to blast over in the penalty area after being brilliantly laid on by Samadi. On resumption, Thomas saved a smart shot from Jose Carlos Aliaga, and Atletico came very close from a melee, before Fernando Torres, who was playing his valedictory game for the Europa League champions, rose highest to nod home his team’s second goal from a corner kick. 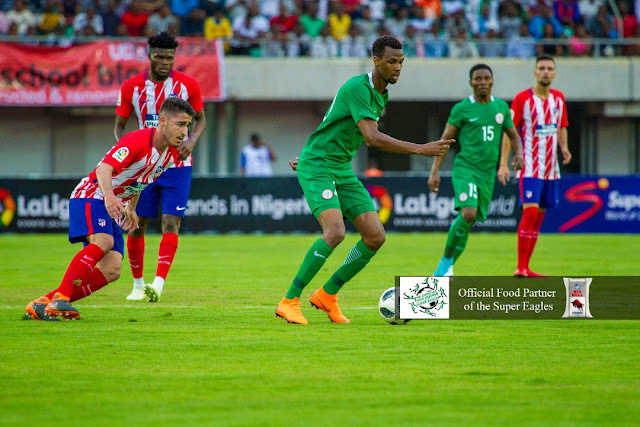 While the Nwakali brothers continued to pull strings in midfield, Captain Musa Muhammed (2013 U17 World Cup –winning team captain) and Ebube Duru showed class as wingbacks, and Duru’s replacement Ikouwem Udoh replicated his impressive form at the CHAN finals in Morocco earlier in the year. Substitute Usman Mohammed, a member of the Nigeria squad that won bronze at the 2016 Men’s Olympic Football Tournament in Brazil, and who plays his club football in Norway, scored an audacious goal in the 80th minute, turning two Atletico players and the goalkeeper inside out after a pass from fellow substitute Tosin Omoyele before slotting past substitute goalkeeper Axel Werner. But there was time for the visitors to net the winner, with substitute Garces Borja blasting past Thomas as Atletico Madrid swept on the homers’ defence with four minutes left. Correa was named most valuable player of the match, and Atletico Madrid were awarded the GOTVMax Cup that was specially for the occasion. Torres was also honoured for his great contribution to the Atletico cause over the years. On the whole, the occasion was a fitting montage to the final phase of the Super Eagles’ preparations for the Russia 2018 FIFA World Cup, which begins in Uyo on Wednesday, 23rd May, and will proceed apace with the international friendly against the Simba of the Democratic Republic of Congo in Port Harcourt on Monday, 28th May. On Saturday, 2nd June, Nigeria will take the pitch against England at Wembley, in only the third official meeting between the two nations linked by strong historical ties, and on the following day, the Nigeria delegation will be flown in a chartered flight to Bad Tatzmannsdorf, venue of an eight-day camping programme at the Avita Resort. In-between the camping, the team will play Czech Republic in a final pre-World Cup friendly at the Rudolf Tonn Stadium outside Vienna on Wednesday, 6th June. The Eagles will fly into Russia for their sixth FIFA World Cup finals on 11th June, direct to the team base camp at Yessentuki. They play Croatia in their first match in Kaliningrad on 16th June, trade tackles with Iceland in Volgograd on 22nd June and take on Argentina in Saint Petersburg on 26th June, in the last game of Group D.